Needless to say, experiencing a bit of Portland's hopping homegrown art scene was high on my agenda during my most recent visit. But -- aaack! -- there was so much to see, and relatively little free time in which to do it. Still, in addition to checking out some of the amazing murals at the Ace Hotel (blogged here), I did manage to swing by a few art spaces during my whirlwind jaunt through the city. I arrived in town just in time for the Pearl District's monthly First Thursday Gallery Walk. Much of the art showing in the galleries I hit that evening wasn't exactly to my taste -- it was pretty polished and very high-end, with a few pieces costing more than the down payment for our house. But I was intrigued by some of the work from artists such as Susan Seubert and Mia Nolting, up through the end of March at the Pacific Northwest College of Art, above. Over on edgier East Burnside a couple of days later, I popped in to Grass Hut to check out the Balls Out! show. The exhibit features contributions by more than 50 artists (many of them local), and I was blown away by the awesomeness on display. 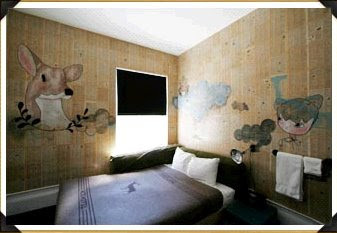 Some of the work is reasonably affordable, too, starting at $80 (though a few pieces are priced at more than $1,000). 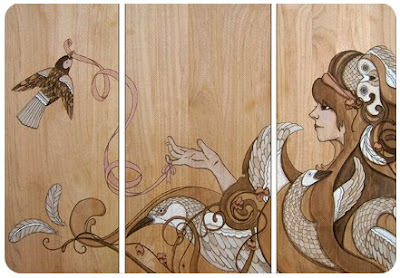 Pieces by Dave the Chimp, Apak, Jill Bliss, Oliver Hibert, and Jeff Soto, among others. Paintings and collage by Chris Ryniak, Lisa DeJohn, Colin Johnson, and others. Tough Case #4, by Meredith Hamm. 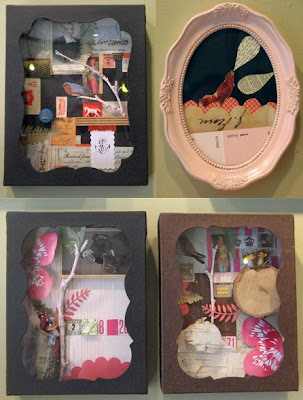 Work by Arbito, Maija Fiebig, Bwana Spoons, Cupco, Kristin Cammermeyer, and others. Balls Out! will be up in the Grass Hut Gallery through March 31. Available work from the show can be purchased here. Little Souvenirs will be up at Redux through the end of March. This painting by Rachel Ann Austin (whose work I also saw at Portland's Crafty Wonderland) was on display at Flutter, in North Portland's charming Mississippi area. A large fiber collage made from recycled sweaters by Portland's Woolie Originals (aka Jenna Robertson), at downtown's Flora boutique. And -- arrrgh!!! -- here are three shows I wish I'd known about while I was still in town: Locks of Lore, a collaboration between artists Evan B. Harris (who I am stalking) and his girlfriend Sarah Jane, at the Grassy Knoll Gallery in Old Town Portland. It'll be up through May, and works from the show are available for purchase in the Grassy Knoll online shop. Prices start at $195. 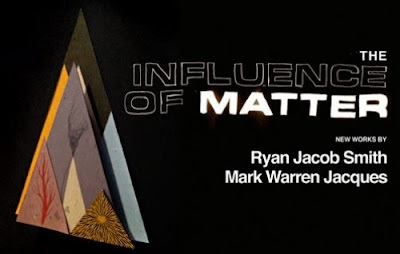 At the Together Gallery, in the upstart Alberta Arts District, Ryan Jacob Smith and Mark Warren Jacques' Influence of Matter will be open through the end of March. Check it out here. Prices for original works start at just $50. 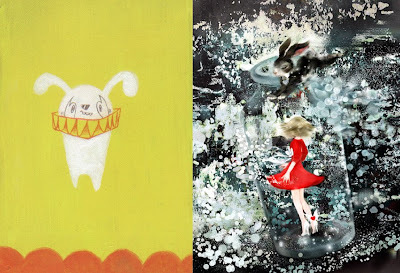 And at Compound Gallery in northwest Portland, Alice: Art from the Rabbit Hole features Alice in Wonderland-inspired work by more than three dozen cutting-edge artists, including Ina Takayuki, below left, and Yagi Tomoko, below right. 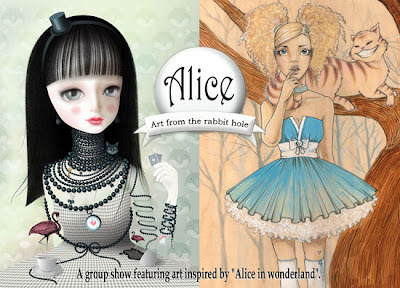 The show will be up through March 30, and prices start at $30. On the art agenda for my next visit to PDX: First Friday in the hipster/industrial LoBu neighborhood just across the Willamette from downtown, and Last Thursday in Alberta Arts. I hear that -- unlike the established (and often super-pricey) galleries in the Pearl -- these are the places to catch one of Portland's many rising art stars. Absolutely gorgeous work! There's clearly a ton of talent in Portland. Such great stuff. I'll be blogging about this later today. 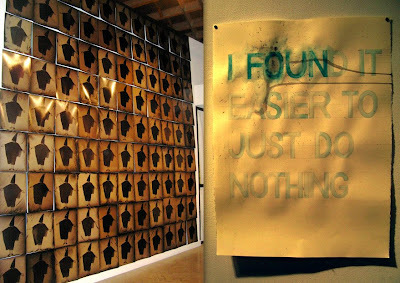 I just returned from First Thursday and with the exception of Eric White's work it was a pile of crap at every Gallery. nothing was impressive it was embarrassing. 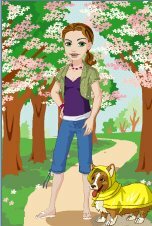 Dianne wants to move from Portland because she is so ashamed of Portland's first Thursday and its lack of taste. It is always a pile of garbage. The curators should be killed.